Looking for outdoor furniture is hard work. From Bunnings to searching at furniture shops at Supacentres, there was nothing that caught my eye. I had an idea of what I wanted in mind but nothing that came close. My criteria was space (I didn't want the table setting to be too big), I wanted it to be made with wood so it needed to be made with good quality hardwood, and it had to be simple, practical, low maintenance and compact. Googling keywords and pictures, I came across Beccali Furniture. It was exactly what I have been looking for. They had beautiful pieces and it was difficult to choose which one I wanted. Did I want to have a big enough setting for entertaining or just the family? In the end I ended up with the setting of four which could still fit six, especially if they were little people. It was made in New South Wales from Australian Blackbutt hardwood. Australian Blackbutt is classified as a Class 1 durability timber (the highest rating possible) and is termite resistant with an outdoor life expectancy of 20-40 years. It is well suited to harsh outdoor environments and treated with a protective coating prior to delivery, unless otherwise requested. 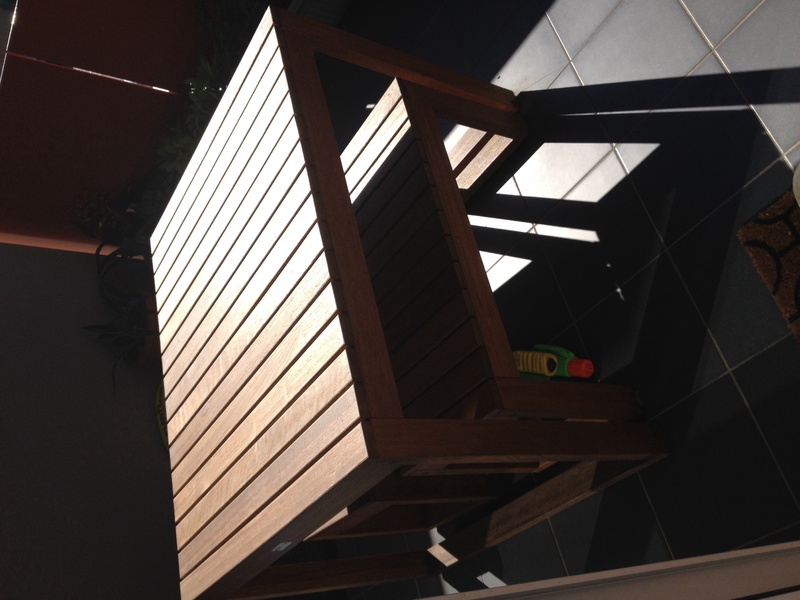 The treatment provides additional protection from the elements, and gives a deeper natural colour to the timber. Untreated hardwood products is supplied at a discounted price for custom staining. Beccali delivered to the house and assembled it together in minutes. What a beautiful wooden table setting with bench seats tucked under that required hardly any maintenance. In time the wood would fade and I was advised cleaning wise all that was required was to hose the table down with water. Beccali can provide custom sized outdoor dining and seating with a protective cover and cushions. Have a look for yourself at Beccali's range. Happy with my purchase so far, a beautiful piece of furniture, perfect to enjoy the outdoors with coffee and magazine in hand.